When information in a passage is organized by the time in which each event occurred, it is organized chronologically. Nonfiction passages that are organized chronologically often contains dates. Fiction passages or narratives are more subtle and are organized chronologically but usually have no dates. A narratives or story is a journey through time, and all of the events are arranged in order of time; therefore, every story has a beginning, middle, and end. Even if an author uses flashbacks, flash-forwards, or otherwise manipulates the time in his or her text, the events still occur along a timeline. Stories require the passage of time; therefore, all stories are organized chronologically. Sometimes time will stop in a narrative. Certain passages in a story may focus on describing scenary or spaces, and use a descriptive or spatail method of organization. 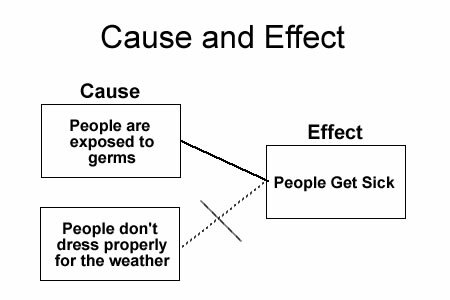 The conflict of a story may be discussed in terms of problem and solution or cause and effect, but the text in a story is still mainly organized chronologically. Stories are told chronologically or in order of time. Example: This morning was crazy. My alarm clock was set for PM instead of AM, so I woke up really late. I just threw on some clothes and ran out the door. I rode my bike as fast as I could and thought that I was going to be late for sure, but when I got there everyone was outside and there were firetrucks all lined up in front of school. I guess somebody pulled the fire alarm before class started. It worked out though, because nobody really noticed or minded that I was tardy. I feel I don’t really understand it would be nice to see examples of what a Chronological text structure looks like. I loved this! SOOOO helpful!!! i love e reading worksheets.com its so fun and even has videos to you have to try it out. What if you describe an issue that develops in four steps. (For example, a deliberate escalation, which is not that uncommon these days.) When you have described the steps you arrive at the issue. When you explain the issue, it seems especially handy to start at the latest point, which seems also most crucial in order to understand what the “issue” is. Then it seems, starting from the “crucial” point you also refer backwards and explain the steps in detail and also the cross-references of the steps. This seems tricky. Either one simply goes backwards to step one, or one addresses some logical or topical issues inbetween in regard to the cross-references (step 4 says something about step 1 which says something about something else – do you wait till step 1 or do you address it together with step 4?). The latter might make it less chronological but perhaps more impactful in regard to some points. Also in regards to logical or topical points, one tends to make summary paragraphs, rather than strewing parts of it in different chronological steps. Such logical paragraphs however can be intransparent in some of their chronological reference. It’s not a trivial issue to interweave the two, though I suppose it can be done in most caes. Another challenge is that when one arrives at the beginning again, one has described the issue in “full” (this far), but is basically back at the latest point again, when the issue is “established”. And perhaps one makes references to this latest point again, which requires some sort of summary sentence but might seem like a jump forwards nonetheless. An alternative would be to explain all steps in chronological order and in detail. This however presupposes some final “judgment” on each step, which might not be representative of how the steps actually come about. And if you describe the actual development in more detail and then explain the issue, it does not seem that different from what I have described before. Should I always prefer chronology (either normal or reverse) in a sequence of steps over logic? To become more clear again, what would be your “basic” ideas on describing a four step issue that becomes crucial at the latest point? The second paragraph fell off in clarity. I meant either going backwards from the latest point step by step (in reverse chronology), or preferring a purely logical coherence of arguments, though that creates “blocks” which are not necessarily connected or chronological. The issue arises in part out of detail. If you are organizing the information in your text based on some mode of chronology, regardless of whether it is told from beginning to end in linear order, I would argue that the text is primarily ordered chronologically. It’s important to remember, however, that the structure of a text can vary from paragraph to paragraph. In fact, a single paragraph can use more than one structure. Pragmatically, however, if students are being tested on their ability to recognize patterns of organization, the paragraph on which they will be tested should clearly use a single structure, else the question wouldn’t really be fair. As far as a text that covers “a four step issue,” unless you are telling a story about a time that you followed those four steps, you are probably ordering your text sequentially: you are writing about steps in a sequence removed from time. Can a narrative be described in reverse chronological order or like in a movie first describe the end and then the beginning? It sure can. This technique is known as flashback / flash-forward. It’s pretty advanced stuff, however, and I’d make sure that you have a firm grasp on the basic of storytelling before attempting more advanced techniques. Nonetheless, beginning your narrative near the end, then flashing back to the beginning and working your way to the end again is a common, yet sophisticated approach to storytelling. can you please fix the whole website thing where you can only join stuff in chrome. Those activities should work in Chrome, Safari, and IE9+. Good stuff and a very valuable resource. Though I guessed the correct answer, I’m a bit unclear what the intended distinction is between Sequence and chronological order. sequential order does not occur at a specific time, like directions to the mall or a recipe for pizza dough. 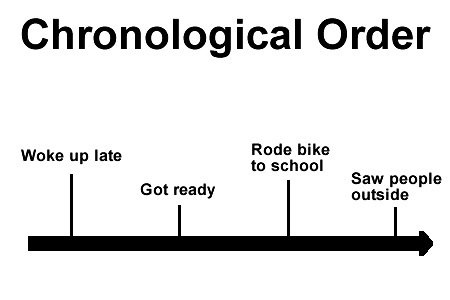 Chronological order, on the other hand, occurs at a specific time and place, like a story about my trip to the mall or when my mother and I made brownies. that was very helpful. Thanx. Thank so much! This is the best one i have ever know about this field! thank you very much for this useful lessons. THANKS now i know whats going on now…!! I’m working on it as we correspond.